Len Denton started wresting in 1977. 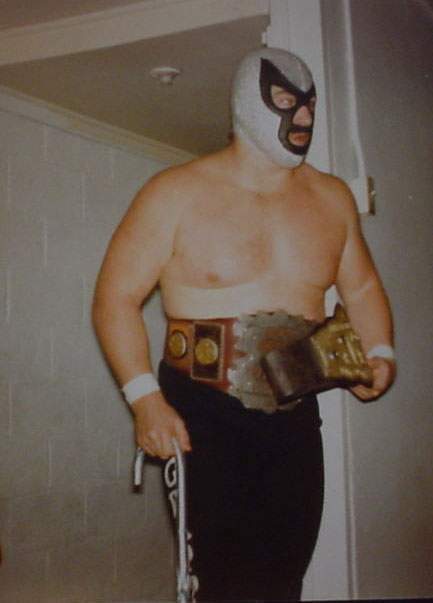 Len Denton wrestled in many territ0ries including Mid-South, St. Louis, the Carolinas, and Portland. Len Denton teamed with Tony Anthony as the Dirty White Boys and later as the masked Grapplers. Len Denton wrestled all the big stars of his era: Ted DiBiase, Junk Yard Dog, Roddy Piper, Andre the Giant, and more. There is a famous story that Jake Roberts and Len Denton invented the DDT finisher after a botched move. Len Denton turned down a WWE tryout in 1995 due to outside considerations. May 11, 1998 WCW Nitro: WCW United States Champion Bill Goldberg defeated Len Denton. January 2004: Len Denton put the old Pacific Northwest title belt up on ebay. August 13, 2005 – Portland Wrestling: Jimmy Snuka defeated The Grappler. March 31, 2006 – AWA: Don Yates defeated Len Denton (The Grappler) in Casa Grande, Arizona.